No level of drinking can completely remove the risks of alcohol-related harm. But changing the way you drink may reduce the risks to you, your whānau or family, and your community. 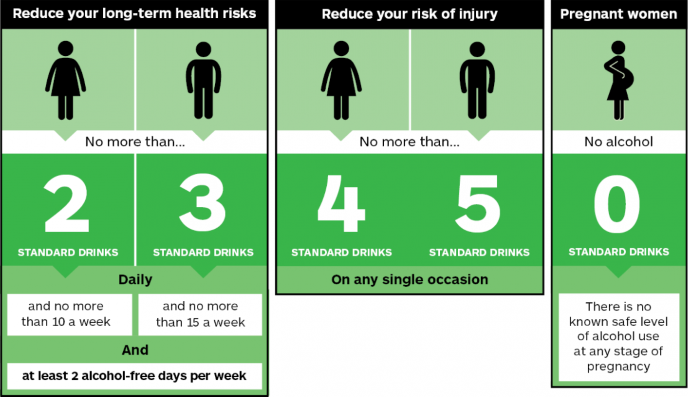 two standard drinks a day for women and no more than 10 standard drinks a week (see What is a standard drink? below. This is shown in the following graphic from the Health Promotion Agency. If you're an older adult, you should probably drink less than this. See Alcohol & older people for more information. A standard drink is smaller than many people expect. In New Zealand, it is a drink that contains 10 grams of pure alcohol. Drinks poured at home or in a bar tend to be more than one standard drink. Advice on how much alcohol you can safely drink and when not to drink. Advice on what a standard drink is. Tips for safe drinking to reduce the potential harm and keep yourself and others safe. On the next page: How can I cut down on drinking? Written by Health in All Policies Advisor, Community & Public Health, Canterbury DHB. Adapted by HealthInfo clinical advisers. Endorsed by Public Health Specialist, Community & Public Health, Canterbury DHB. Page created March 2017. Last updated November 2018.